Creator-endowed each creature with fur protects the body functions but for humans, evolution has made fur and hair is the decisive factors to aesthetic and sociological nature. Sometimes you wonder why there are people born with black and brown hair, but someone gives birth to blond or red hair color. Or why this person has very thick hair but the other one has thin hair. Find out the hair structure to know more about hair cuticle damage, and related things to have the right hair care! 2 2. The reason of hair cuticle damage. 2.1 a. Anagenes: Development stage. 2.2 b. Catagenes: Transition period. 2.3 c. Telogenes: Rest period. Fiber consists of 2 parts: root and shaft. The root is located under the scalp and is covered by a pocket-shaped structure called follicle. The bottom of the hair root is in a gourd. Capillaries and nerves enter into these pots. The cells in the center of the pots are divided. New hair cells push up the hair cells earlier. Cells moving outward will gradually die to form a hard hair body. The main chemical composition in hair fibers is keratin which composed of many proteins and accounts for about 70%. 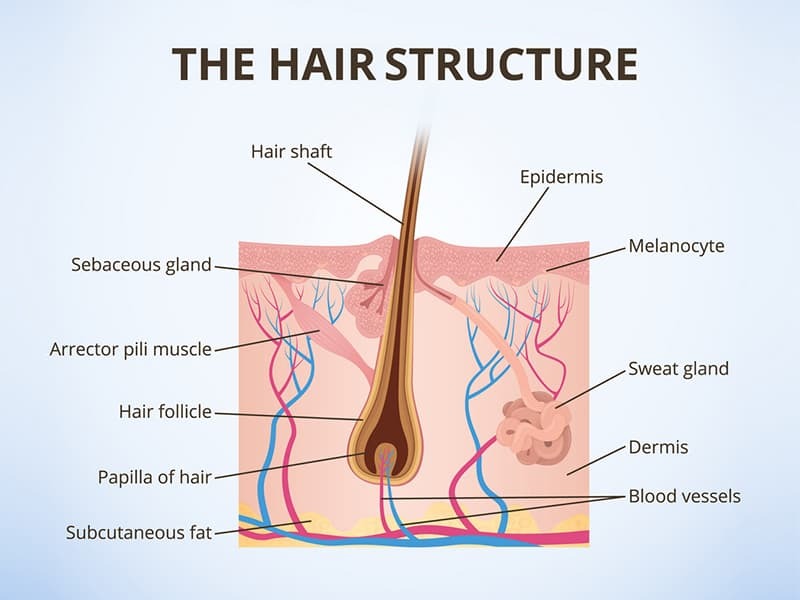 Keratin grows from hair follicles (hair roots). The rest includes water, fat, carbohydrates, vitamins and minerals rich in biotin, zinc, sulfur, and nitrogen, accounting for about 30%. According to hair cuticle diagram, hair follicles are part of the cup that lies under the scalp and contains a lot of tiny blood vessels. Hair follicles adhere to the scalp so that nutrients follow blood vessels to feed the hair. This is the only “living” part of the hair shaft that helps hair grow longer. Around the hair follicles, there exists oily glands (sebaceous glands). The lubricate hair fibers and muscles to help hair “build up”. Furthermore, the hair follicle cells reproduce regularly and the hair lengths gradually out. Hair fibers have a growth cycle, which lasts only for a while and then falls off. In each person, an average of 50 to 100 hairs falls every day. Hair body is the hair you see and has a structure of 3 layers including cuticle, cortex, and medulla. It is the innermost part of the hair, contains fat particles and air. If the hair is too thin, there is no marrow layer. It is the outer part of the hair shaft, consisting of 5-10 layers of stacked transparent keratin that protect hair fibers from external chemicals or influences. Between the scales, keratin has a binder called KIT. A thin lipid membrane for waterproof hair covers the cuticle layer. 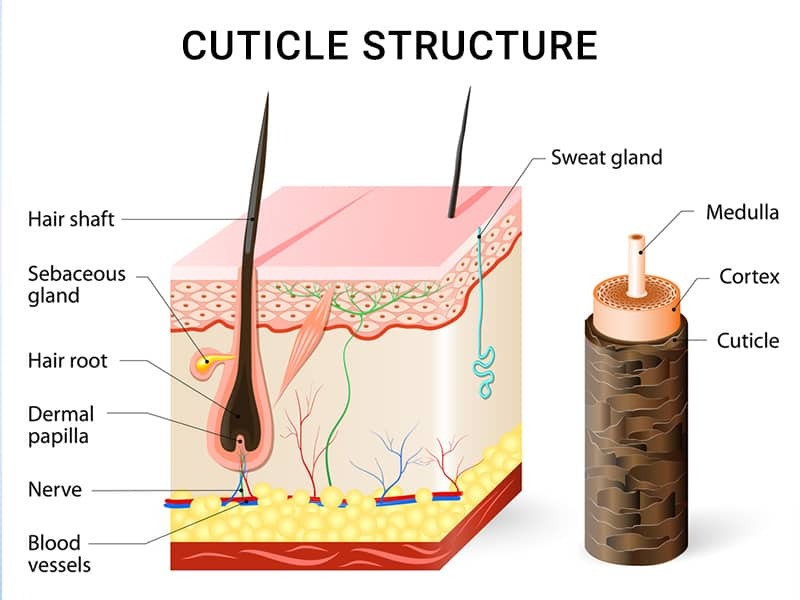 The cuticle is tightly bonded to the outside of the hair core, protecting the hair, determining the surface structure and smoothness of the hair. That’s what we call the function of cuticles. Solar ultraviolet rays, chemicals in dyes, shampoos, conditioners, hair curling agents, and so on can lose KIT adhesives, causing keratin scales to peel, and damaged hair. Excessive heat from a dryer or hairpin, as well as combing hair also disturbs the smoothness of the healthy epidermis and known as hair cuticle damage. Therefore, you should limit use flat or dryer way as well as changing your hairstyle in a short time which will make your hair weak and avoid hair cuticle damage. 2. 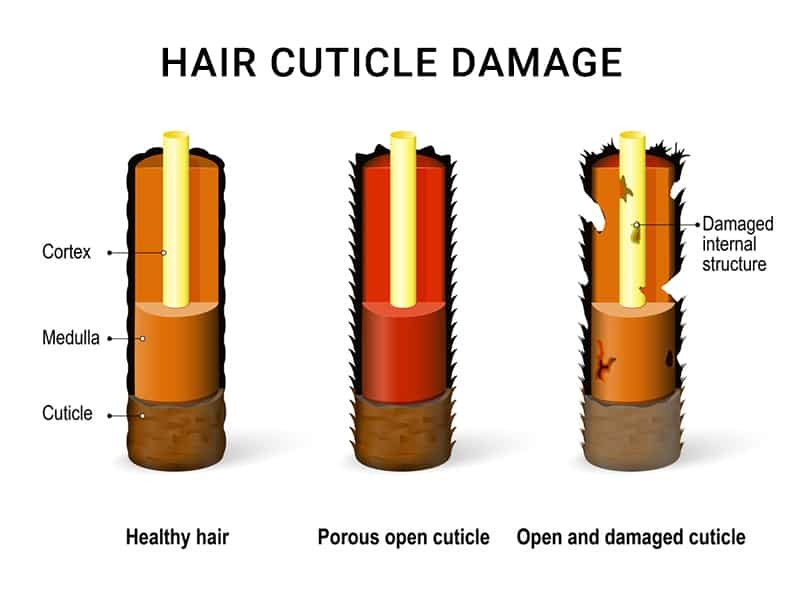 The reason of hair cuticle damage. To understand the reason of hair cuticle damage, it’s significant to get to know about the hair philosophy. Each strand of hair goes through a growth cycle consisting of 3 stages lasting about 3-6 years. Each month the hair grows about 1cm long. Hair growth will slow down when the length of the hair is greater than 25cm. Genetic genes determine the length of hair growth periods. About 85% of the hair on our heads is in development. This phase lasts from 3 to 6 years. When hair grows to the maximum length, the hair begins to enter a transition period of 1-2 weeks. During the transition phase, the hair follicle shrinks about 1/6 of the diameter compared to normal. After the transition phase, the hair changes to a resting period of 5-6 weeks which is about 10 – 15% of the hair on the headrests. 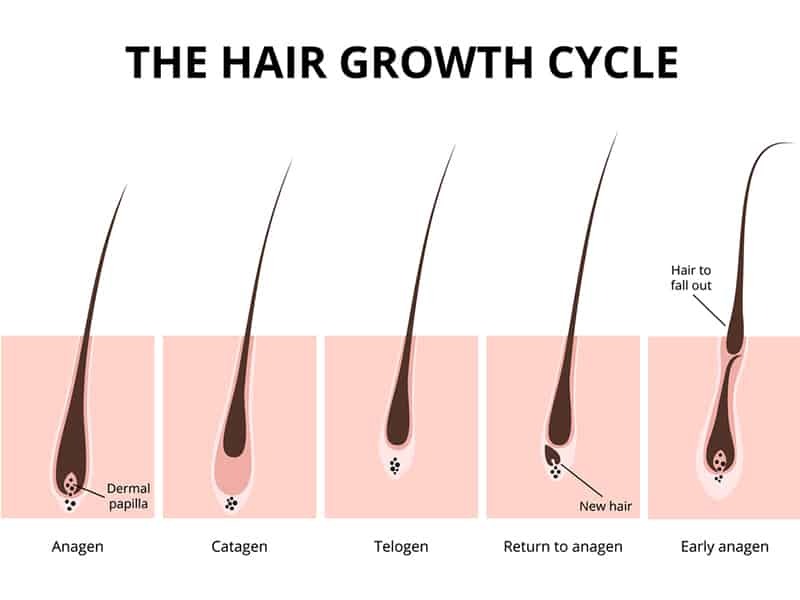 At the end of the break, the hair follicle restarted a new hair growth cycle. 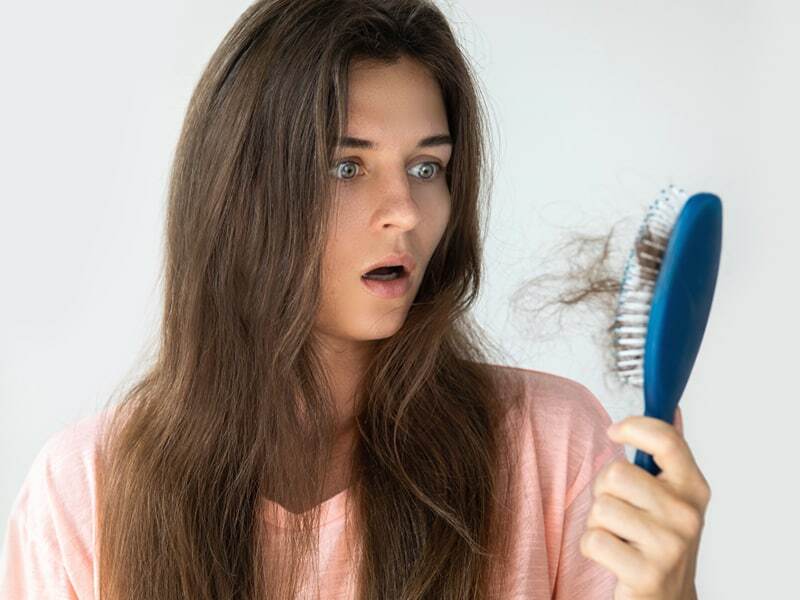 When you see a lot of hair loss in the bathroom, hair on the pillow, falling on the floor and on your shirt and stuff like that, it is the time you face the hair cycle disorder or hair cuticle damage. So, the right thing to do is take care of hair, nourish hair follicles and scalp to stop abnormal hair loss, and avoid the risk of baldness. The key to nutritional supplements that many people mistakenly take is to care only for the hair shaft while this is the dead part without caring about hair follicles and scalp. In fact, hair follicles and scalp are important factors affecting the growth cycle and healthy shine of hair. If it is early detection and management, blocking hair loss is quick and easy. Therefore, you should spend time taking care of your hair in a natural way instead of chemical ways. Hope that after the post, you will know more about hair structure, hair cuticle damage and the right way to take care of your hair. You should remember that hair is the most important part of the human body, so don’t forget to spend the time to “look after” them in the right way and limit damage them. For more reviews and advice from Layla Hair, stay tuned and keep up to date!